The Louvre Museum has 8.5 million visitors per year. 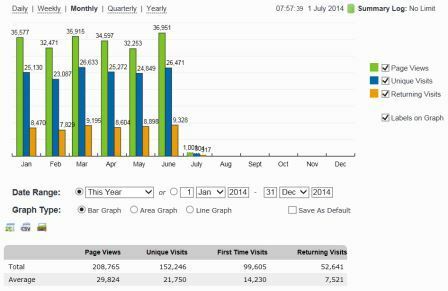 This blog was viewed about 450,000 times in 2014. If it were an exhibit at the Louvre Museum, it would take about 19 days for that many people to see it. No Minister is consistently the site from which most visitors come. Keeping Stock is still a top referrer even though, sadly, it has gone into recess. Thank you all for reading and even more for contributing to conversations. P.S. Thanks to WordPress and its staff who provide the platform for this blog, give prompt and helpful assistance when it’s required and provide such good service. One of the challenges for the leader of the opposition is to look like a Prime Minister in waiting. It’s one which David Cunliffe has yet to master, and his silly apology for being a man was another example of that.
. . . The Labour Party election year congress dominated the first part of the week, with Cunliffe’s rather strange apology for having both an X and a Y chromosome. It was all very well for Labour’s apologists to splutter – as they did – about the apology being taken out of context. The only context which matters is Cunliffe wants to be PM of this country, and is campaigning ferociously to get the job. In this context, the apology made him look either silly or weak. People don’t, by and large, go for leaders who look silly or weak. And, looking back, the thought of, say, Norman Kirk, Peter Fraser or Michael Savage apologising for being a man boggles the mind a bit. . .
Labour was once the party of the working man – and woman. It’s strayed a long way from those roots.
. . . Meanwhile, the scourge of domestic violence continues across all communities, sadly without discrimination, right across the country. Let there be no doubt about the severity and complete unacceptability of any violence against women and children in our society. That has to stop – now – and, as the major perpetrators of that violence, men have to face up to their responsibilities in addressing it. Bold action, across the board, is required right now – not simpering, gesturing apologies for a biological fact that cannot be easily altered. We need to take the wraps off domestic violence and expose its prevalence wherever we can. Police revelations there are around 200 reported cases every day of the year are part of that. Our aim has to be to make any tolerance of domestic violence as unacceptable as drink-driving and smoking have been made in earlier times, so that underlying social attitudes are changed. . . . The last thing we need is the absolute trivialising of a serious social problem by fake and insincere apologies, designed more for a headline, than to do any meaningful good. The women and children of New Zealand who live in constant fear and suffering because of domestic violence deserve a far better response than that. And I make no apology for saying so. . .
Dunne has no need to apologise for taking a serious issue seriously. Associate Education Minister Nikki Kaye says Labour has clearly not done its homework in the education area and is promoting “new ideas” that have already been put in place by National. “Most of what Labour has announced today is already being delivered by the Government through its 21st century schools programme. We have a massive build plan underway to modernise school facilities, upgrade school broadband networks and partner with communities to provide digital hubs through those networks. Our Ultrafast broadband and rural broadband initiatives are delivering fibre broadband with uncapped data to nearly every school in New Zealand. Labour want to put money into professional learning development for ICT over the next few years. National has already invested $35 million in Professional Learning and Development, specifically targeted at learning with digital technologies. Labour want to build an unspecified number of new schools and classrooms by 2030. Under the National government, hundreds of millions of dollars has been spent building new classrooms and upgrading older schools with the help of the Future Investment Fund, which Labour opposes. 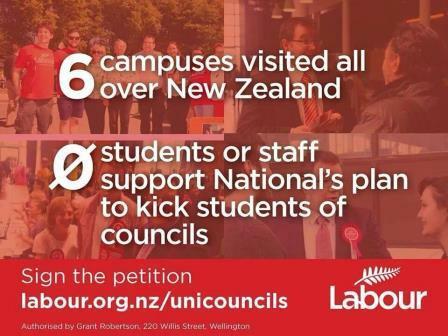 National has opened 12 new schools in the past three years in areas of growth. And Labour wants to enable students to access the internet at home. Last year, National announced a change in policy to enable schools to extend their school internet to the surrounding area so students and families can access the internet from home. Ms Kaye said the device subsidy programme also did not appear to have been thought through. “There is an amazing lack of detail. Are they really going to make the subsidy available to every one of the 580,000 children in years 4 to 13? How do they plan to deal with rapid changes in technology? Is the plan limited to one device throughout the period of the student’s time in school? If not, how many devices? How are they planning to deal with the interest costs? All these questions must be answered. “Labour has simply not done their homework. It really does make you wonder what they have been doing over the past six years. “Our Future Focussed Learning report, sets out the direction the National government is going. “Labour really needs to research what’s happening and catch up,” Ms Kaye says. This ignorance of 21st century education schools isn’t surprising when Labour spends more time looking backwards than forwards and appears to be stuck in the 20th century, fighting old battles. But that isn’t the only problem with the policy announcement, it’s yet another yeah nah one.
. . . For those schools that opt in, the policy would require parents to pay about $3.50 a week to pay off the cost of the device, estimated at about $600 each – and the Government would put in a $100 kickstart payments. The device would belong to the child after it was paid off. For the poorest families which could not afford the payments there would be a $5 million hardship fund to call on. Teachers would also be given training in how to get most use out of the devices through a $25 million programme in 2016 and 2017. . . The party that thinks parents can’t afford a $100 donation a year now want them to pay six times more than that. The policy is based on the Manaiakalani Trust programme in Tamaki, which works with 12 lower decile schools to provide students with a netbook and 24/7 access to the internet. Keeping Stock points out that is essentially a public-private partnership. But Labour would rather spend taxpayers’ money on an initiative when there’s already a very good model supported by sponsors and trusts they could use. Is it any wonder even they don’t expect to be in government for another 27 years. The combined total of the top left-wing blogs, which are at third and fourth, is still less than Kiwiblog which is second and miles from Whale Oil in first place. Dim Post from the left is seventh and Keeping Stock from the right is 10th. I’m at 12, No Minister, which is more right than not is at 14th and Imperator Fish which is left is 16th. Labour is threatening to tinker with the Reserve Bank Act to keep interest rates down. They are conveniently forgetting that interest rates have been at an historic low for three years and interest rates were far higher when they were last in government. The OCR increased by 5.00 in November 1999, went up and got to 6.50 in May 2000, stayed there until March 2001, went down to 6.25 and continued to drop until it got to 4.75 in November that year. It was all up from there reaching 5.75 in August 2002 before going down again and getting to 5 in July 2003. The reserve Bank increased it to 5.25 in January 2004 and it climbed from there, reaching 8.25 in July 2007 and staying there until it went down to 8 and was at 6.5 by October 2008. National won the election in November and the OCR went down from then, getting to 2.5 in April 2009, increasing to 2.75 in June 2009 and 3 in July. It stayed there until March 2011 when it went down to 2.50 where it’s stayed until today. Several factors have influenced the low rate, including the global financial crisis. The government had no influence over that but it has had influence over its own spending which is another big influence on the OCR because of its impact on inflation. 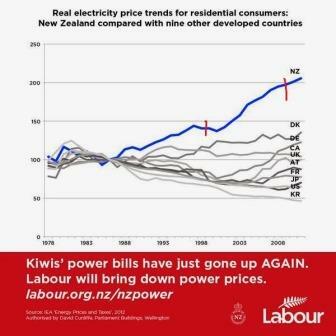 National has been very prudent with its spending and intends to continue that as the economy grows. Labour and its potential coalition partners appear to have no familiarity of the concept of fiscal prudence and should they get into government, their high-tax, high-spending policies would fuel inflation and drive up interest rates. 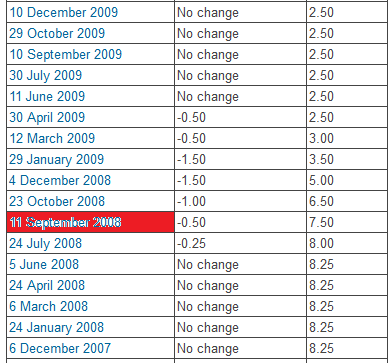 Labour couldn’t keep interest rates down last time it was in government. What would it do differently if it was in power again? It’s not going to rein in its own spending and tinkering with the Reserve Bank Act would do more harm than good. It would lead to higher inflation which would do far more harm than the small increase in interest rates we got this morning. Hat tip for chart: Keeping Stock. Three smogs and you’re . . .
Three SMOGS – social media own goals – and you’re not looking like a government in waiting. As someone with an unfortunate propensity for typos, I know how easy it is to make mistakes. But a political party ought to ensure other eyes to check their tweets and Facebook posts before they hit publish to save themselves from SMOGs.